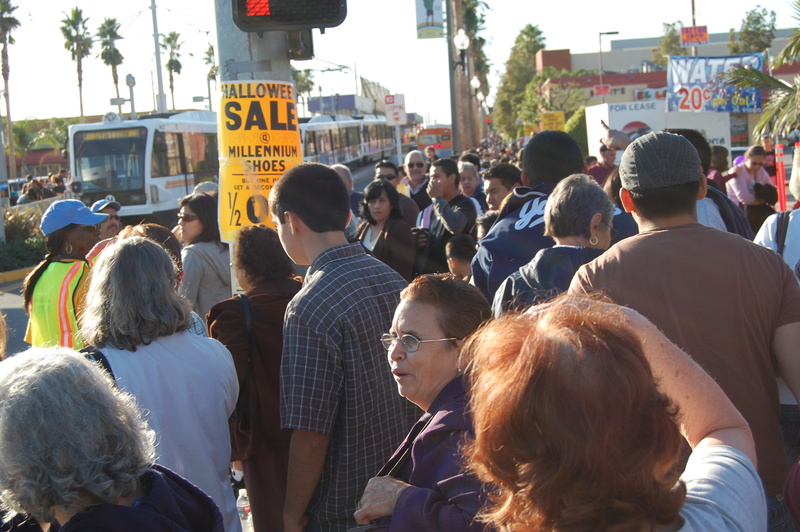 Throngs converge on the Atlantic Gold Line Station in East Los Angeles Sunday afternoon. The MTA said 50,000 people rode the line which was free for the day. The people of East L.A. came out in droves to celebrate the opening of the East LA Goldline Sunday, when the MTA christened its line by offering free rides all day. It was a unique experience. The train stations — and trains — were more crowded than the freeways. I drove the Pomona (60) Freeway and it was wide open. Even the sidestreets were not crowded with cars (Pomona, Atlantic were relatively clear). I took the above photo Sunday around 3 p.m. and the one below but I didn’t ride. I waited in line for more than 30 minutes and estimated I still had another 15 minutes to wait just to hop a train going west toward downtown LA. A woman from Pasadena, whom I met in line, told me that all the stations were crowded by the early afternoon. She was attempting to get back to the Soto Station where she left her car. She said the East L.A. Civic Center Station and the Mariachi Plaza station were both filled with people Sunday. The question remains: Is this a typical show of ridership for the new, 6-mile long line? Or were people just out for a free ride? 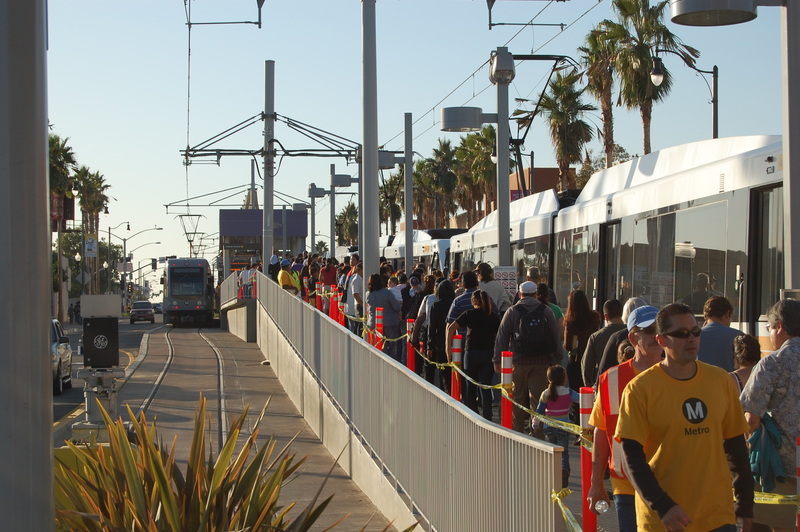 WIll people ride the new Eastside Gold Line once they have to pay the fare? And will the fares stay low enough to attract riders? The signs of new life abound in fall in Southern California. 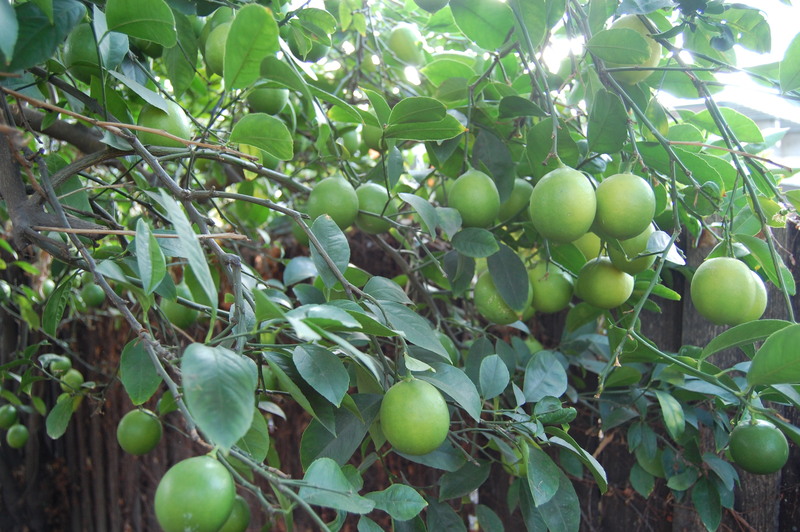 These are slightly green lemons on my backyard lemon tree in Temple City. THREE nights ago, my wife ran into the kitchen to tell me that the weather machine atop my dresser showed a cloud with a lightning bolt — coming out of Wednesday! Then, when Wednesday arrived, the rain indicator was … gone. Erased. No more angry cloud. No bolt of lightning. Just a partially obscured sun. It was like those obnoxious California Raisins had hacked into my high-tech weather gauge. I drew open the vertical blinds in our bedroom and ta-da: Sunlight! It’s hard keeping track of the weather in the fall. I mean, for us mortals, I can’t speak for Fritz or Dallas. Do I wear a sweater? Corduroy pants? Cotton or wool? Should I pack sunscreen or lip balm? Sunglasses or an umbrella? Argh! This is as unpredictable as Mike Tyson’s next move. I’ve become convinced that this weather confusion is the result of an East Coast media bias. We live in a semi-arid region (near a desert) yet we live by an East Coast/Midwest weather script of falling leaves, cool winds and soaking storms. Well, it ain’t gonna happen. Then why do department store ads bombard us with sweater-wearing mannequins and scenes from winter wonderlands? If I see another cold and flu commercial where the flu sufferer struggles to get in out of the cold, damp air I’m going to toss my box of Kleenex at the telly. Tell those advertising “mad men” that as a Californian, I suffered with a head cold three weeks ago during 90-degree weather! You start to think: I shouldn’t be sick, this isn’t “flu weather.” Great, now the entire advertising industry is making me feel guilty because I have a cold!! They do the same thing to holidays. Wal-Mart is pummeling West Coast viewers with images of grandpa decorating the tree while grandma stirs a waiting cup of hot cocoa. This is not true for 38 million Californians. So get it off my TV. Do marketers think us on the West Coast have eaten so much turkey that we are too drugged to figure out we’re not in Kansas? Thanksgiving may have been about pilgrims and Native Americans breaking bread in the dim, cold Massachusetts climate, but here, it ain’t dim and it ain’t cold, not even on Nov. 26. Hence, families and friends should do sunny and warm things on Thanksgiving. I’ve made it a tradition to play tennis every Thanksgiving morning — outdoors. When I couldn’t find a partner one year, I went for a bicycle ride. A colleague last year deep fried his turkey. Another co-worker always has a balcony party with a barbecued bird and potato salad. An oh yeah, instead of wool vests and corduroy pants, everyone wears shorts, Hawaiian shirts and flip-flops. I looked out our bedroom window yesterday morning and saw the neighbor’s grapefruit tree weighed down with globs of succulent citrus — big green melons turning yellow and thriving. The new bougainvillea in our front yard is finally in bloom. And the apple tree has new green shoots. Fall? Dead leaves? Barren trees? Think again. Now, if I could just have an accurate Southern California weather gauge. And a season with an apt name. I’m thinking, instead of fall, let’s call it “dry” or “post summer.” What would you call it? Hahamongna Park is all about the natural space. Here, the oaks dominate the landscape. What to do with several old buildings abandoned by the U.S. Forest Service. 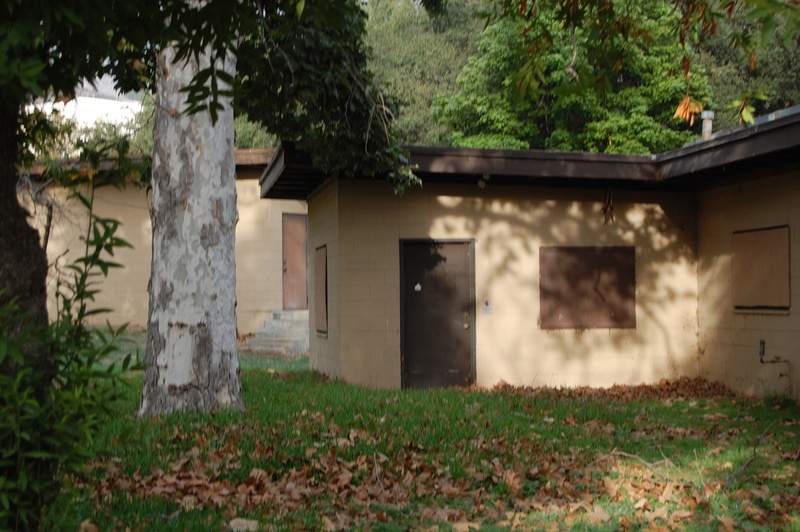 Should they be restored and re-used, say as meeting rooms or a nature center? Or should they be torn down and something else rebuilt? Should a trail be widened to become a road to feed a parking lot at JPL? If so, should the non-native trees there be torn down, while the oaks, protected? 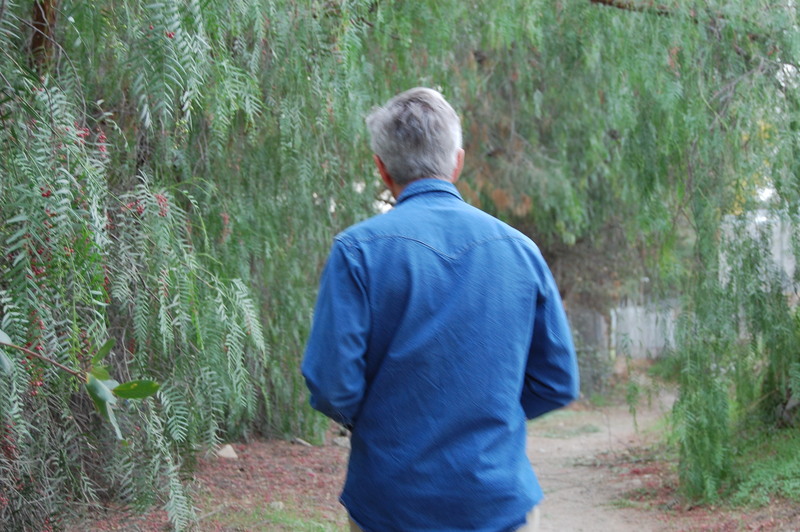 Below is a picture of my boss, Larry Wilson, public editor, walking along the trail north of the equestrian area and just south of JPL. 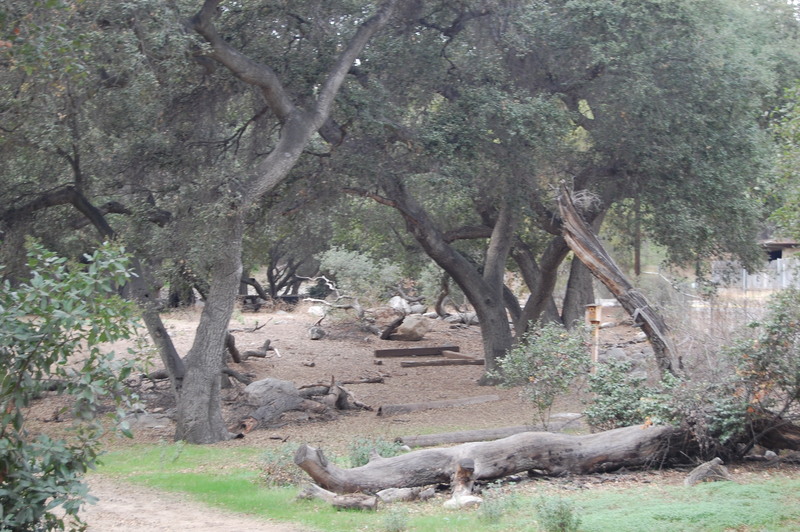 The pepper trees (non-native) form a canopy around the walkers. Like in Irvine, park development is taken quite seriously in Pasadena. That’s a good thing. Here’s to keeping the place rustic, but improving its use and functionality. I pulled around to the back parking lot of the church, and there was nobody. Not a soul. Not a parent pushing a stroller. Not a car in the very large parking lot. I parked and walked into the all-purpose room to cheers: “Hey, we have a customer!” greeted the head volunteer. Now, my town (Temple City) only had one race : two seats for Temple City Unified School District. But come on folks, let’s get out the vote. GOTV! 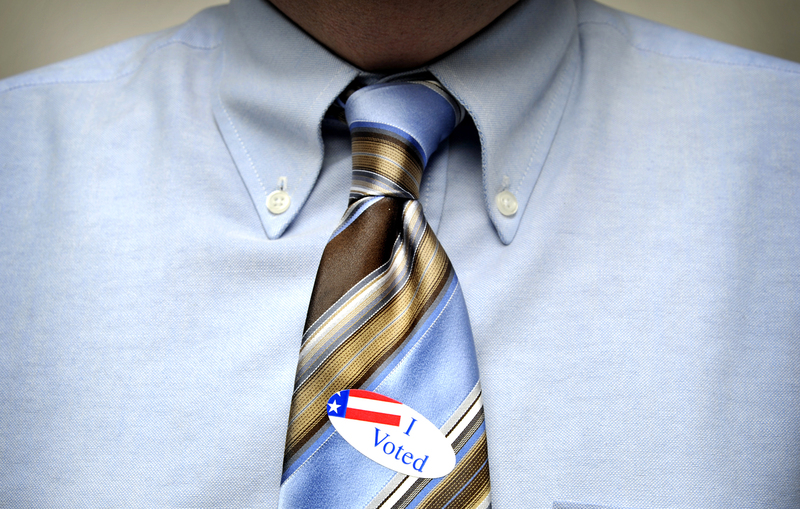 Polls close at 8 p.m. Go to our web sites for more information on where to vote (www.lavote.net). If you want to see our editorial board’s recommendations, go to our web sites (www.sgvtribune, www.pasadenastarnews.com, or www.whittierdailynews.com) and go to Election Coverage. Click on that and you’ll see a series of hot links called OUR VIEW: … find the endorsement you are looking for. Or, go out and BUY one of our newspapers. On page A17 we have a list of our endorsements. But no matter how you vote, don’t forget to vote. It is what our soldiers are fighting for in Iraq and Afghanistan. It is part of our republic — voting for leaders. It is a precious gift. Exercise it. There, I’ll get off my soap box now…. Happy Election Day!!!! !